Frederick Knott’s taut 1950s thriller is given an excellent revival in Lucy Bailey’s production, currently playing at the REP. 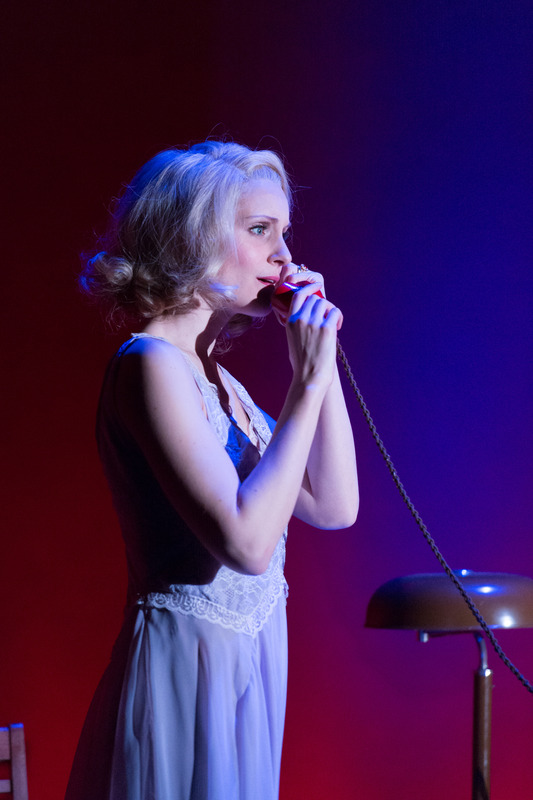 It is very much a period piece and Bailey does well to preserve the 1950s feel while giving her production a fresh contemporary-retro atmosphere. This is due in no small part to Mike Britton’s glamorous red set with its stylish 50s furniture and translucent walls and curtains. There are two revolves: on one stands the furniture; from the other, a curtain hangs. Both revolve slowly, almost imperceptibly, at various times during the action – it’s like seeing the inner workings of a machine, the cogs of Knott’s plot at work, as the villain sets his wicked plan in motion and the playwright winds up the tension. Daniel Betts is suitably urbane and smarmy as the villainous, betrayed husband Tony Wendice, who enlists old school acquaintance and bit of a wrong ‘un, Captain Lesgate (a very good Robert Perkins) to bump off his cheating wife. The plan hinges upon a telephone call at the crucial moment – hence the title – and when the violence takes place, it is all the more shocking for its stylisation. Fight direction by Philip d’Orleans is complemented by unsettling contributions from lighting designer Chris Davey and sound design by Mic Pool. Even though I have seen this play staged before, the new lease of life given to it by this production, meant I was still enthralled and thrilled. Bailey doesn’t let the stylish presentation get in the way of Knott’s superbly crafted script. Kelly Hotten is appealing as intended victim Mrs Wendice, looking every inch the 50s starlet under Chris Davey’s cinematic lighting. Philip Cairns is her lover Max, making it easy to see why Mrs Wendice prefers him to her husband. Christopher Timothy tops off this tight ensemble as determined Inspector Hubbard who worries away at every detail of the case like a dog with a bone, until the truth is brought to light. Wordy passages of exposition are counterbalanced with wordless moments of action – Knott knew exactly what he was doing and this production clearly demonstrates why this play is a masterpiece of the genre.